The chinese antique furnifure is of exquisite design, unique workmanship and careful carving. It has been the rare treasure and one of the most splendid parts of Oriental culture. 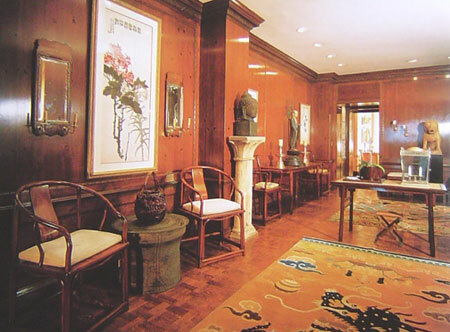 The paneling in the entrance hall is original and is made of Georgia pine, the most popular timber for paneling when the apartment was built in 1929. The carpet with dragon motif was not woven for the floor, it would have been wound around a pilar in an Imperial palace hal. When the two sides join the dragon's body becomes complete. The painting is from a set of 20 th century Chinese paintings. The rest, over 90 of them, are hanging in the Metropotan Museum of Art, not far from Ellsworth's home.